It is day 12 of our Homemade Christmas ornaments series. I left the easiest for last. 🙂 However, it is also one of our favorites. 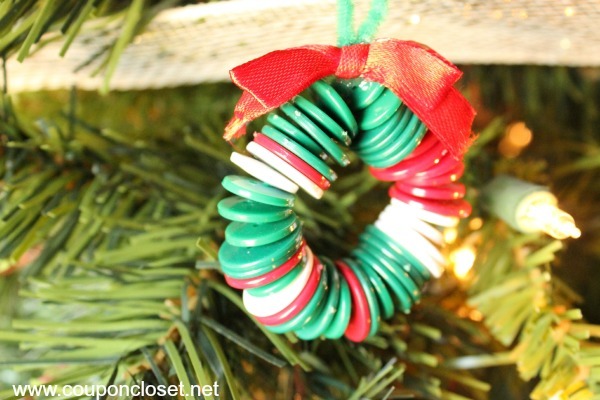 You definitely want to make this button wreath ornament with the kids. Yep – that is it! That is all you need to make this super easy homemade Christmas ornament. All you do is take one pipe cleaner. Let your child string on buttons on the pipe cleaner. Let them do any pattern or no pattern at all. String them on until you have enough to make a circle. Fold the pipe cleaner over to close the circle then loop the pip cleaner up to make a loop so you can hang your wreath ornament. Take your ribbon and make a small bow. Hot glue it on or tie it on. That is it!! Hang it on your tree and enjoy it. My oldest son is 9 right now, but he made this when he was 4. It is so much fun to take this out each year to see what he made so long ago. 😉 Make this easy ornament this weekend with your kids so you can have that same special memory each year you take them out. Of all the homemade Christmas ornaments I have posted this one is definitely the easiest. Make it out with your kids this week.